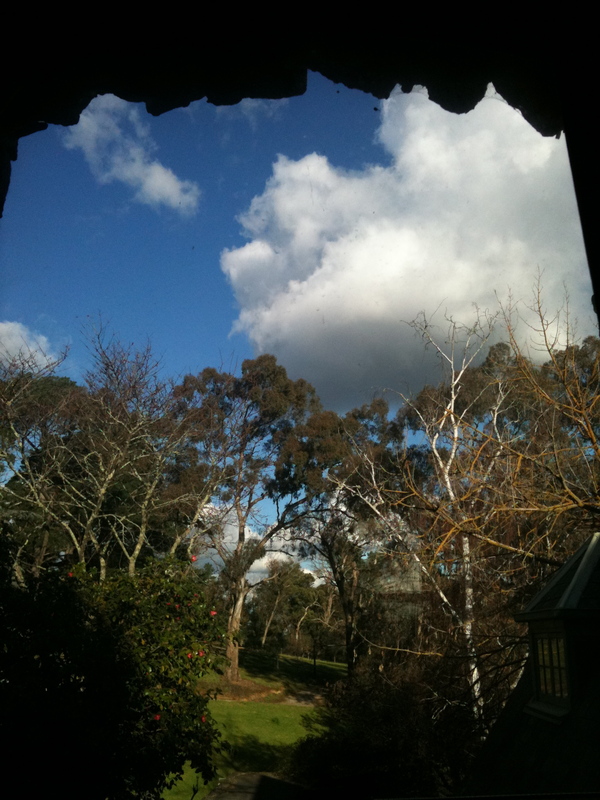 The below three staggered images whilst technically not a Triptych are three of nature’s views associated together as the window compass points from a desk in Sue Vanderkelen’s Tower at Montsalvat, Eltham (Montsalvat was founded by Justus Jörgensen, click on the link to learn more about this artist’s colony). Family madnesses have subsided and I have taken up a 6 week writers residency here. Whilst permanent residence may not be possible on a continual basis this will be my Miller work place for 6 weeks with various ‘home’ interludes. 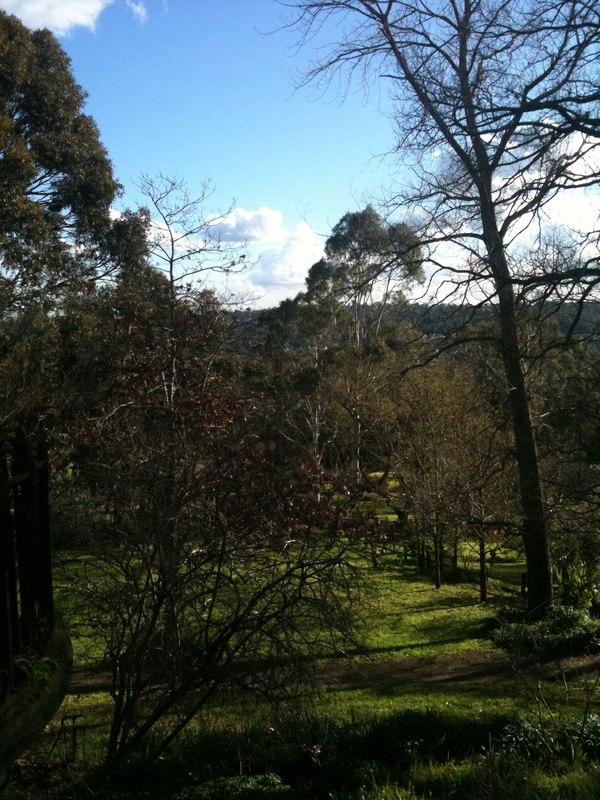 The sun shines on the afternoon of my entry and the grounds have a winter crispness that suggests moist earth and reveals sharp greens, bare branches and the constancy of the green-grey winter eucalypts. I sit in Sue’s Tower arranging my space, nibbling on almonds and dried fruit and designing the best laid plan for the next six weeks. This is a true submersion point into the Miller journey where I have been gifted space in a tower free from domestic distractions; as all good towers should be! Review the working plan form of the biography based on the outcome of the reading above. Be careful to allow the ideas to flow and form the shape that is true for Miller. Take time here, this will be the skeletal form, the bones of the book. While I was wriggling my toes on the last post the universe opened with warm and generous contacts. It does seem sometimes during the research process that all doors are closed – you are an outsider, an interloper, a stranger – and then they open. I was able to make arrangements with Peter Pinson to meet in September when I next hope to be in Sydney, arrange a future phone call with Peter Laverty mid-August and I spent a wonderful afternoon on Sunday with the son of one of the executors of Miller’s will. The voices are coming with a great generosity of spirit and stories of, and surrounding the ancient soul of my research: Godfrey Miller. 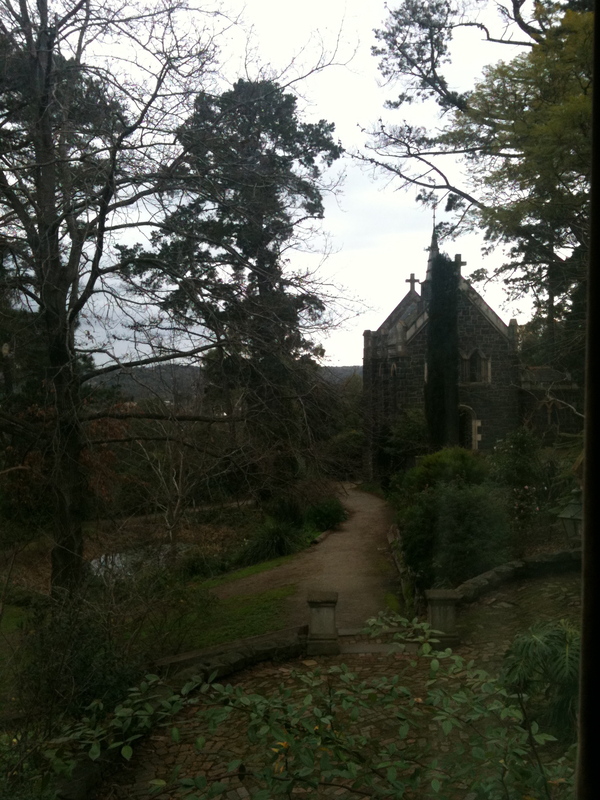 This entry was posted in Montsalvat and tagged Montsalvat, Triptych, writers residency. Bookmark the permalink.